Moving weekend! Woo hoo! My husband and I decided it was time for us to get our own place. There have been some issues with my father in law having Alzheimer’s and we just really need to have a place of our own. I am very excited about it because that means I get to have my own kitchen and we will have a lot more space. I am going to miss having most of the bills paid and having someone in the house all the time if I feel the need to talk to someone. Truth be told I do enjoy living here for the most part, but I am definitely ready to get into a place that we don’t have to worry about other people being there when we want time to ourselves. 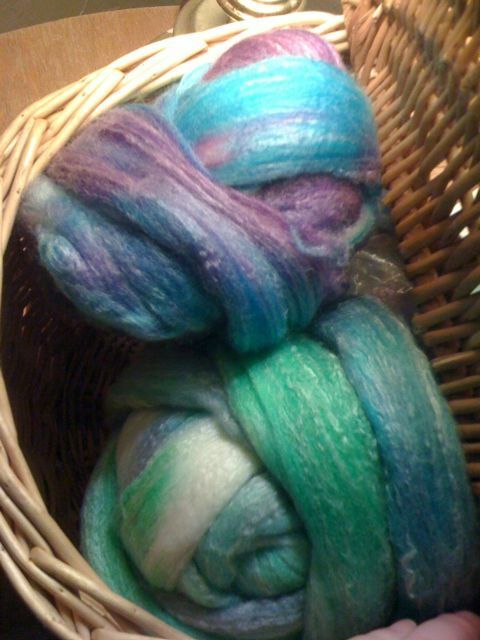 Spinning & Dyeing: Well my work load has been really light this week. So light that I haven’t worked at all. I have had about 2 full days that I have had enough time to spin. I got about 5 oz spun up total. Not as much as I would have liked for having an entire week off, but I did have a ton of things I had to do besides spinning. I did however manage to get 4 oz of fiber dyed. Shades of green. Its pretty. I am thinking about adding just a tad more green to it. I wanted it to be a little darker than it came out. So once we get settled in our new place, I just might have to do a little green overdying. No promises though. Knitting: I got my Wool of the Andes yarn in for the Meret that I am making for my mom, and the scarf I am designing to go with it. I haven’t started on it yet because I have wanted to spend as much time spinning so as I can. I plan on starting it tomorrow though, if we have time after we get everything moved over to the new apartment. Well we made it to 2010! I was so excited about having 5 days extra off in two days, but having Christmas and New Years in there really messed me up. Even though I was off work, I still ended up busy. I ended up getting half as much done as I wanted to. Shop announcement: My etsy shop is now up and going! Right now I have some fiber for sale. I have some that I am spinning to sell, and some handspun waiting to be listed. Not having Internet on a decent computer makes me want to scream. Soon. 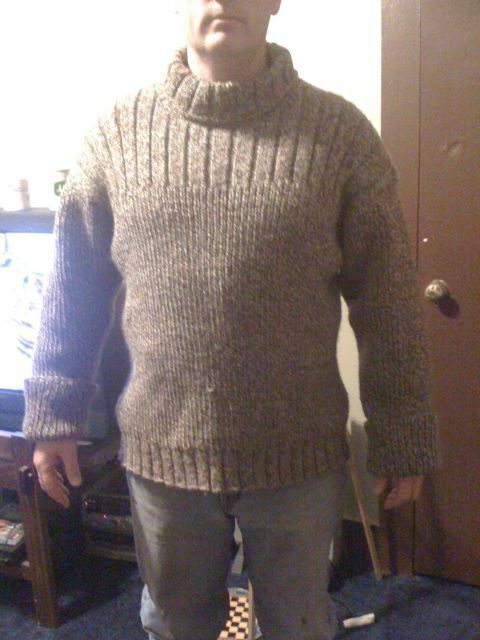 Knitting: I finished the Fog sweater! I can’t believe it is finally finished. I told Jim it would be finished before 2010 and it was! Barely! Now I have started on the afghan for Jacoby and I am already having issues. I think the pattern has some issues in it. But this is me and crochet so that could be the problem! Lol! Spinning: I have some of my merino bamboo hand dyed on the bobbin right now. I am still decideding how I going to ply it. Because of the color changes, I am tempted to Navjo ply. I just love seeing the pretty colors all separated on the bobbin. It may end up being a 2 or 3 ply. I also have some alpaca on another bobbin. I haven’t decided what I am doing with it, but I need the other bobbin soon. I may wind it off and ply it up later. I should think about that today. First of I wanted to say that I will hopefully have everything ready to start listing on Thursday, December 31, 2009. I am starting out with a kind of light load of hand dyed roving. The hardest part right now is that I need to take some pictures to list. Once I get that done, I will be ready. Also I would like to put some hand-spun on there, but most of what I have ready to go right now, is some that was kind of beginner yarns, if that makes sense, so there are sometimes places that are not entirely even. Just in a few spots. I am wondering if that would even be something that anyone would like to buy. It isn’t thick and thin yarns, it is like thin with the occasional underspun spot. I may put it on and explain about it and if no one buys it then I will just keep it. I do need to measure it all again though, before I can list. I was going to have some stitch markers to go with them, however, I have just not made the time to make more than one. Yup. One. There are reasons though. Knitting: I did not finish the sleeve before Christmas. The Fog sweater is STILL not done. Every time I have tried to set aside time to knit, something has come up. Ok. One of the somethings was a PS3. Christmas Eve I planned to knit all day, but we had 14 people in the house, and I couldn’t concentrate with everything going on around me. I did really enjoy the fellowship with the family though, so I suppose it was worth it. It WILL be finished before Jan. 1. I have all day New Years Eve to myself to knit. If I have to stay up until midnight finishing, it will get done. If it doesn’t please don’t yell at me. So since it is coming up on the new year I figure that I ought to go through and start looking at projects for 2010. I am excited about this. February is the Ravelympics and I will be knitting along with TEAM KNITMORE! I haven’t decided on a project for this yet. I am seriously thinking a pair of fair isle mittens, but I have to see what hours I will be working before I commit to this project. I may try entrelac socks. I will post my 2010 knitting goals later on this week, probably on New Year’s Eve. For now I will say that I would like to knit a tam, as well as at least 3 shawls this year; one for me, my mother, and my best friend. I also have Christmas crocheting to do for my favorite 3-year-old in the world. Spiderman blanket. I believe that once I get the pattern down, it will take me no time. *fingers crossed* I just have to finish this sleeve first. I am skipping lunch today to knit on the sleeve. Spinning: Ok. Fiber. I have been trying to put as much time in this sleeve as I can so I have set the spindle down until I get it done. 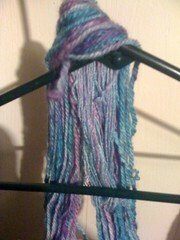 I have been doing some dying and some of that will be spun up. I have a few ounces set aside that were a test dye, if you will, that is broken up into about 6 or 7 pieces and I don’t really want to sell it that way. If it was like two big pieces, it would be different, but some of these are just 8 or so inches long. Maybe someone would like that, I don’t know, so I am going to spin it to sell. It will be laceweight, probably. Most of what I have been dying is two colors. I am going to do some probably tonight that will be a solid color. I haven’t decided on the color yet though. Sewing: I have been working on some designs for some bible covers. Mine currently does not have one and I have some ideas of what I would really like out of a bible cover, so I have them drawn out. I need to do some measuring and get some materials and get to work, but the knitting and spinning are higher on my priority list. Just know that this is stewing in my brain a bit. I will have pictures as soon as I get one completed. Well I finally got a picture of the fiber I dyed. I’ve been knitting on the never ending sleeve. Apparently my notes are missing so I am going to have to go back and count increases on the other sleeve. I wish I knew where that notebook was. So Christmas is Friday. I am not going to get done with the sleeve I have a feeling. I have only worked on it once this week for just a few minutes. I do plan on working on it today, but we have a family Christmas thing this afternoon and I am sick. Sleep may happen instead. I am going to try to get some dying done, though cuz I can nap while doing that. I only work two days this week so I will be knitting like a crazy woman to get it finished. The blanket for my favorite 3 year old hasn’t even been started, but it’s crochet so it will go fast. I hope! Well I am off to shower and start knitting on the never ending sleeve. Oh. One last thing. I want to knit a beret so bad. Don’t know who for yet though.